Sophie and I went for long overdue haircuts tonight. I love our haircut nights. It’s a night out, just the two of us. I get to see my friend Nicholena. Sophie gets to inform Nicholena how I have no idea how to do her hair (picture Sophie piling all her hair onto the back of head, as in a messy bun) in the mornings before preschool, so Nicholena teaches me. Sophie is happy. I’m happy. My hair feels good again. 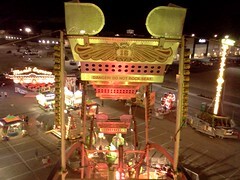 On the way home, we passed a carnival. On a Thursday night. On Colerain Ave.
Sophie was wide-eyed, looking at the ferris wheel while we sat at a stop light. It was 9pm. On a school night. I looked at her. 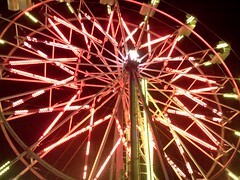 I looked at the ferris wheel. I looked at the clock. I looked at the red light. I could give her a bit of magic, I thought. Or we could go home. I turned in. We parked directly behind a large trailer. The entire rather large carnival seemed open—the rides were running, the people in charge of games were yelling—but there were only a couple people milling about. I found the ticket booth. 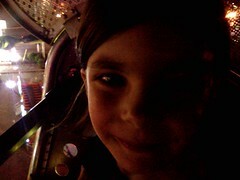 “Is she old enough to ride the ferris wheel?” I asked. There were two older women in the booth, hair piled on top of their head, all thick makeup and bright red lipstick—I swear it was if we had walked onto a movie set. They peered over the glass. And mumbled something. After several attempts I heard “38.” Sophie had to be more than 38″ tall. I pushed Sophie up against a stick with heights marked on it. She passed. And she was thrilled. $7.50 and six tickets later, we walked over to the ferris wheel. There was no one on it. We passed no one while walking to it. I looked at Sophie, expecting her to be nervous. She was clutching my hand, giddy with excitement. She kept looking up at it, the pure lighted beauty of it. A man strapped us in, put down a metal bar and took all six of our tickets. And off we went. It was higher than I expected. And faster than I expected. Sophie and I held hands tight. As we neared the top and started to go down, my stomach did a flip-flop. I closed my eyes. While I clutched Sophie’s hand tighter, she opened her eyes and mouth wider. And squealed with delight. I suppose, because there was no one at this strange Thursday-night-on-the-side-of-a-road carnival the man in charge of operating the ferris wheel was giving us an extra long ride. For 10 minutes we went around. And then he stopped us. We just sat there, slowly swinging. Sophie was thrilled with this development. While she was reaching her free hand up above her head (I was still tightly clinging to the other one) screaming “I’m touching the skkkyyy!! !” I began to question my parenting. Who has a carnival in a deserted store parking lot on the side of the road on a Thursday night? Do carnivals like this have licenses to operate? Permits? Does someone do a safety check? How often? How is it possible that I can spend hours researching car seats and plugging electrical outlets and cutting up blueberries but then put my daughter on this? We started moving again. “I want to let go, Mama!” Sophie said. And she let go of my hand. I turned and looked at her. Every once in awhile I know that a moment I’m seeing, hearing, feeling, smelling, will be with me always—in every tiny little detail. 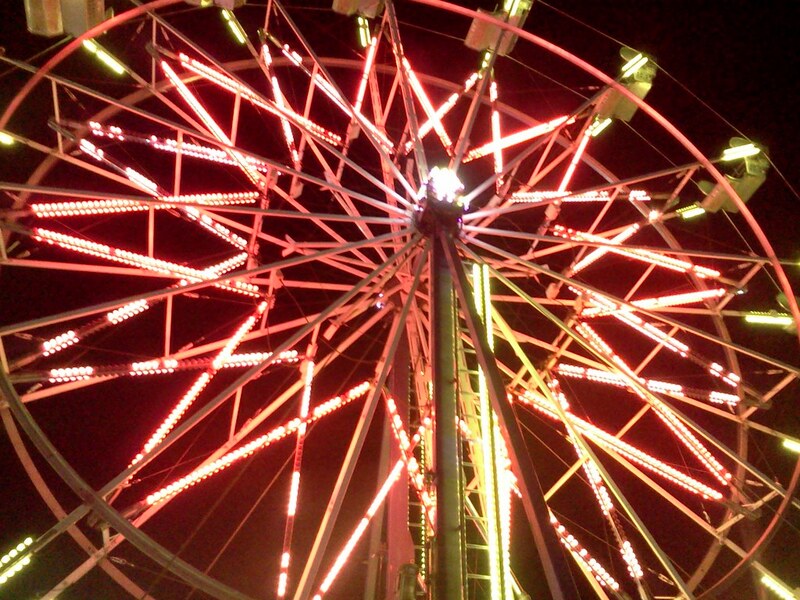 I felt that, knew that, when I saw her face, the ferris wheel lights backdropped against it. It was the look in her eyes, in particular. It was pure joy. And that’s just it. As parents we worry and plan and prepare and analyze, agonize, all so we can get on the ferris wheel, hold tight and then just let go. And so I did. I let go of her hand, and I let go of my worry, and for a small moment I let life be. And then the operator stopped us at the top, again. Because that’s just it, too. As much as we have to let go, sometimes, even when they may not want us to, we also have to hold on tight. The next time around he stopped the ride. We thanked him. Sophie was high on excitement, high on the thrill of her first ferris wheel ride, high on the idea that sometimes an ordinary Thursday night can become extraordinary. I was simply thankful to be back on solid ground, on the way to our Subaru that held the well-researched car seat, on the way to the house where I cut blueberries for much longer than needed. I was thankful for the feel of Sophie’s hand in my hand, and thankful for the moment she, we both, let go. I was thankful for tonight’s view from up high. 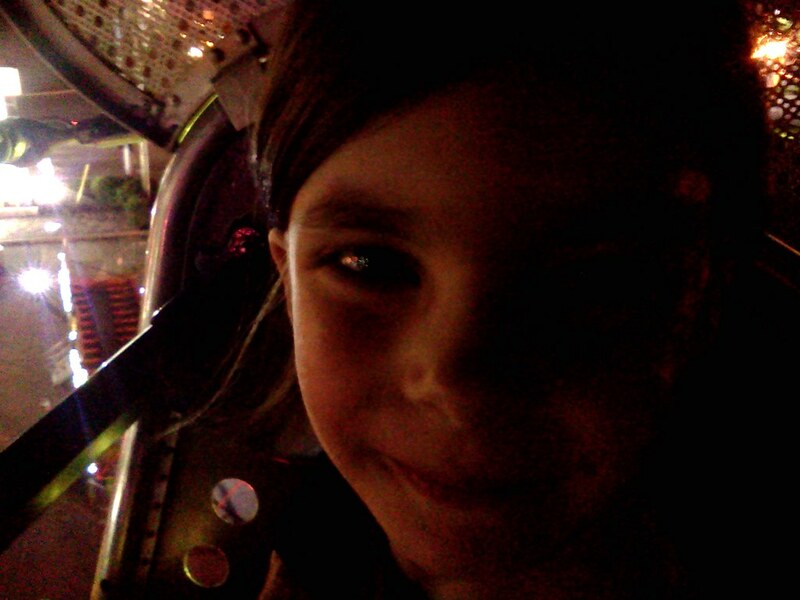 This entry was written by kara, posted on May 3, 2013 at 12:32 am, filed under All and tagged carnival, ferris wheel, hair cut, magic, Nicholena, night, parenting, Sophie, worry. Bookmark the permalink. Follow any comments here with the RSS feed for this post. Post a comment or leave a trackback: Trackback URL.